AFC Rushden & Diamonds have been told they have to register a number one shirt, despite the club having retired the number in memory of Dale Roberts. 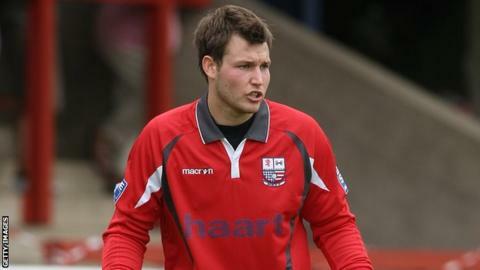 He killed himself in December 2010 while a player for Rushden & Diamonds FC, who were dissolved in 2011. Rushden's phoenix club were promoted to the Southern Football League Division One Central last season. Roberts' number has not been worn since his death, but league rules say that each squad has to have a number one. The club requested that their goalkeeper could have special dispensation to wear number 17 instead, but that was rejected by the league. An appeal to the Football Association has yet to be concluded, meaning the starting goalkeeper against Petersfield Town on Saturday will have to wear the number one shirt. "The club's other 35 teams will continue to use the numbers 13, 17, 24 and 86 for their goalkeepers," said a statement. "Dale's memory will always be cherished and respected by everyone at AFC Rushden & Diamonds."